Are you looking for a way to have guests enter through your gate nice and easily? Intercom installation is the best solution and there are plenty of systems to choose from depending on property needs. “Gate Repair Lakeside” can be trusted to give you the best service in this community. 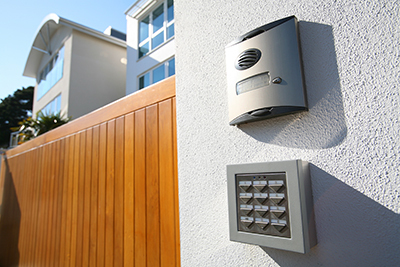 We are experienced with all gate intercoms and promise exceptional Intercom Install & Repair. Our installers are well trained, experienced and well-equipped. We are quick when responding to intercom gate repair service calls and accurate when we install intercoms. We use brand names like Doorking, Elite and Linear and excel in their products and their installation. There are different types of entry systems, Residential, auto dialers, no phone line and programmable telephone. These intercoms are usually connected to your home or office telephone line, can be wireless and have keypads. Each gate intercom system is designed to facilitate the entrance of a single family or multiple tenants and employees at apartment or office buildings accordingly. Each tenant will have a different code, temporary codes can also be used by temporary personnel and, as an overall, the proprietors will have the chance to keep a two ways communication with the people standing at their gate and depending whether they want to allow them access to buzz the proper button or not. In any case, Gate Repair Lakeside is an expert in all these different systems regardless of their complexity. Finding a good reliable phone enter system can be challenging but you can surely have our assistance and support. We are knowledgeable of these systems and, above all, promise outstanding intercom system installation and programming. Our Intercom Install & Repair teams are skilled and well-trained and will provide immediate service. You can count on our efficiency, professionalism and knowhow of these exceptional intercom systems. Whether you choose a Linear or Doorking intercom, you can rely on our expertise. Our intercom repair service is immediate and of high quality. Contact us anytime you need our help!